A superb free-kick from James Hammond and a brilliant penalty save from Lewis Carey see the Rooks grab all three points against a strong Margate side. Lewes came away from the seaside with all three points in their bucket thanks to a superb first-half free-kick from James Hammond and an equally impressive penalty save from Lewis Carey, reports Stuart Fuller. Darren Freeman made two changes to the starting XI from the 3-3 draw on Monday against Bognor Regis Town with James Hammond and Lloyd Cotton coming in to replace Michael Dome-Benwin and Stacey Freeman respectively, who were both carrying small injuries. Lewes started the game on the back-foot with the hosts looking to get the ball up to Taylor and Collin quickly, using the speed of the 3G surface. With just five minutes on the clock the home side had the ball in the net but fortunately the flag was up for offside. Two minutes later a superb Luke Blewden ball across from the Lewes right nearly saw Bouwe Bosma in at the far post and the end to end pattern for the game was set. Lewis Carey was soon in action again making a double save from Taylor and Collin then the Rooks broke and Ronnie Conlon should have done better when in a great position. Conlon then combined well with Redwood on the edge of the box and was illegally squeezed. After the referee and then Margate keeper Newcombe, had finally sorted his wall, ignoring the advice of the travelling Rooks, James Hammond superbly floated the ball over the wall and into the roof of the net to give Lewes the lead. Margate responded with purpose and force a couple of quick corners but on both occasions a combination of Carey, Cotton and Chappell cleared the danger. At the other end Blewden’s volley narrowly cleared the bar, giving the Rooks fans something to cheer as the half ended with the away side 1-0 to the good. The first ten minutes of the second period saw Margate take control of the game, forcing the hard-working midfield pairing of Hammond and Lawson deep but the Rooks broke swiftly and Jonte’s through ball to Ronnie Conlon should have nestled in the back of the net rather than in Newcombe’s hands. The introduction of Harry Reed saw the Rooks change up a gear, with the youngster combining well with Steve Brinkhurst and prove to be a constant thorn in the left-hand side for the home team. In fact Brinkhurst got a little too excited at one point, breaking into the area and hitting a shot that scraped the bar – the nearest the full-back has come to scoring for the Rooks for over three years. Jonte then set up Bouwe but his lob over the advancing keeper also cleared the goal. The home side looked dangerous going forward but fortunately found Carey once again in inspired form, making saves from Collin and Taylor again. Lloyd Cotton got a bang on the nose that required treatment off the pitch and within a minute of returning he was adjudged to have brought down his man after he slipped on the surface. Harsh call but Carey saved the day, getting his hands to the spot-kick from Collin and beating it away. Within seconds Lewes broke and Harry Reed was clear on goal but his shot was blocked by a defender as the Rooks looked to tie the game up with a second. The game was still being played at a furious pace despite the heat and the referee was happy to let it flow although few in the ground will have thought Evans’ late and high challenge on Leon Redwood only merited a yellow with seven minutes left. 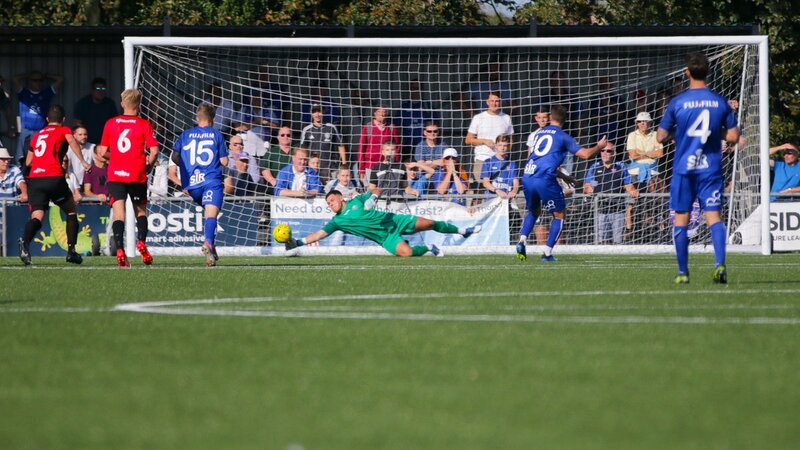 With the game moving into injury time Margate had one final chance with Collin’s shot well saved by Carey and then Taylor’s follow up also smothered someone by the Lewes keeper. After nearly six minutes of injury time the referee called a halt to proceedings and the three points were going to be heading back to East Sussex. This was another impressive team performance from the Rooks with everyone putting in a real shift on a very hot afternoon. Whilst it is still early days in the season, the Rooks have now taken points off four of the pre-season favourites for promotion and can look forward to Wednesday’s FA Cup replay against Molesey with renewed confidence. Manager Darren Freeman was understandably delighted with the team performance when he spoke to Barry Collins after the game. Pictures thanks to the vivacious James Boyes. Next up for The Rooks is the FA Cup Preliminary Round Replay against Molesey on Wednesday night at The Pan, kick-off 7:45pm.